Deliveroo, Foodora, Giovo. The success of these companies depends on the exploitation of an invisible precariat. Now, against all expectations these workers are mobilizing across borders to claim their rights. Callum Cant, writing for politicalcritique.org, examines recent development in worker-led action in gig economy settings. A strike by Deliveroo workers London in the summer of 2016 was the first sign that food delivery platform workers were capable of mass collective action. The strike spread from Deliveroo to UberEats, and then around the UK. A year on, that struggle has spread transnationally. Food delivery platform workers have now been on strike in over ten cities across the UK, Italy, France, Spain and Germany. Their struggles have both won victories and faced serious setbacks, but the fact remains that a transnational movement of precarious labour has emerged from what appeared to be the most unlikely of circumstances. Workers who were supposed to be weak and powerless have spread their antagonism with capital across borders in militant, unmediated action. This transnational circulation of struggle provides an example of how the changing composition of the working class can provide new opportunities, even as it demolishes old certainties. 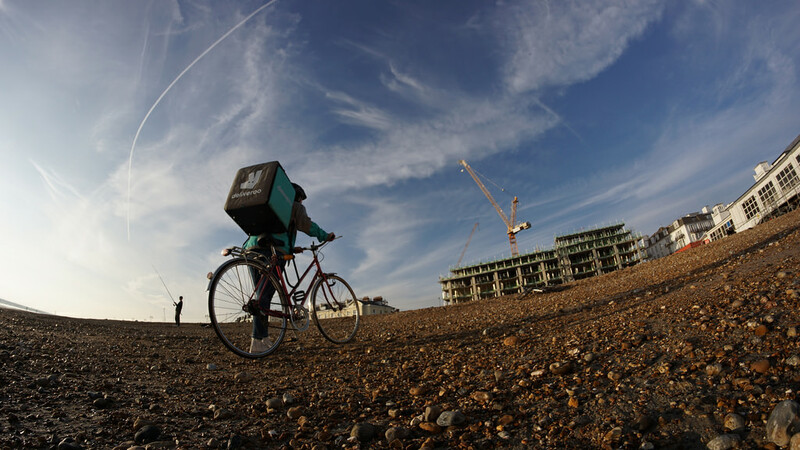 The UK movement began when Deliveroo workers in London were told that their contracts would be shifting from an hourly wage (£7) with a bonus per delivery (£1) to a piece work system (£3.75 per drop). Informal networks in seven different areas quickly mobilised to respond. Hundreds of riders went on strike over the course of a week. This action forced the company to allow striking riders a choice of pay structure, and set the tone for the disputes to come. After the initial wave of action in London had subsided, two unions got involved in organising with Deliveroo riders. The Independent Workers of Great Britain (IWGB), a small breakaway union formed in 2013, began to organise with workers in Camden in London, the epicentre of the summer strikes, and the Industrial Workers of the World (IWW) engaged with workers nationally and in Bristol and Leeds particularly. The Rebel Roo, a self-organised Deliveroo workers bulletin, also began to be produced with support from the political group Plan C.
Month by month, the level of organisation and action outside London developed. 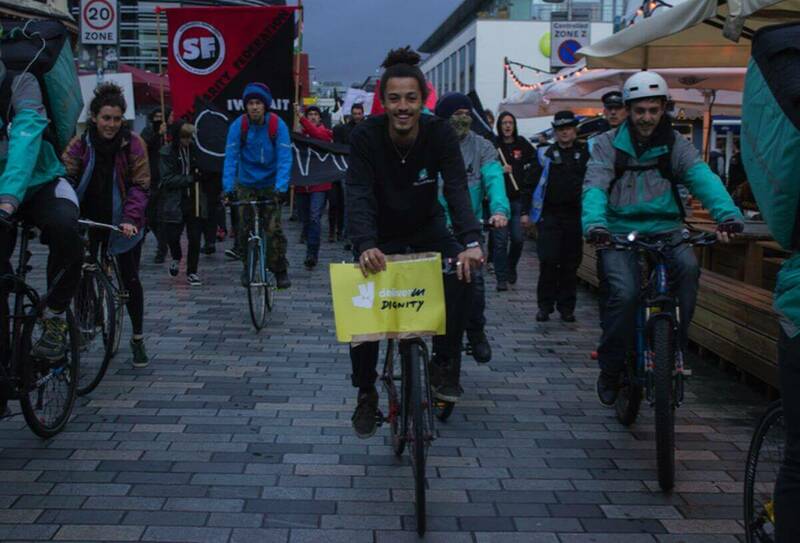 Workers running training shifts for Deliveroo went on strike and won in Bristol, followed by unionisation and strike action in Brighton over low pay and the beginning of a concerted organising effort in Leeds. By February the circulation of Rebel Roo had grown to 1500 a month (about 10% of the national workforce) and there were the beginnings of organisation in cities as socially and politically diverse as Bath, Middlesbrough, Liverpool, Portsmouth, Manchester and Glasgow. Key parts of the movement converged for discussions at the Transnational Social Strike Platform’s assembly in London in late February, and the movement seemed to be approaching a critical point. Struggles in Leeds and Brighton achieved significant victories but failed to scale up nationally. When seven workers from Leeds were victimised, the IWW were keen to push for national strike action, but there was hesitation elsewhere about the possibility of such an escalation. This hesitation coincided with a fall off in momentum nationally. Struggles in Leeds and Brighton achieved significant victories but failed to scale up nationally. The victimised workers in Leeds were reinstated and the manager who had victimised them sacked, and workers in Brighton won a recruitment freeze, but the movement at large faltered. In Brighton, riders pushed forwards with forming a coalition with other precarious workers, culminating in a ‘Precarious Mayday’ demonstration. But despite these positive steps, the moment had gone. Precarious Mayday Brighton. Image Courtesy of the author. The counter-offensive by Deliveroo involved significant concessions in certain local zones which drove up average wages, but, significantly, these were mediated through the app’s obscure distribution of work rather than contractual changes. Gradually, the most organised zones in the UK began to fall into inactivity. In the context of this retreat of worker action, the IWGB union fell back on the legal avenue it had been pursuing to challenge Deliveroo’s use of ‘independent contractor’ status to avoid legal obligations to its workers. This challenge is ongoing, and has been supported by the left-wing leadership of the Labour party. 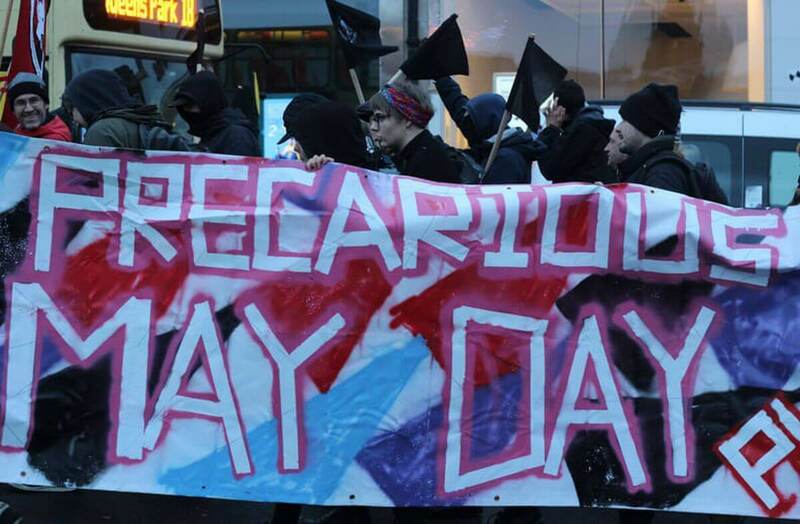 After the London strike, organization became contagious. Suddenly, workers across Europe began to take action. The struggle in Italy saw the first mobilisations of Foodora riders begin in Turin in October 2016. About half of the 100-strong Foodora workforce went on strike when the company attempted to change their pay from hourly (€5.40 an hour) to piecework (€2.70 a delivery). They formed a critical-mass strike demonstration alongside social movement groups and circled the city. The demands of the movement centred on costs (data, bikes), on hourly wage parity with Milan, and on employment rights like sick pay and holiday pay. The overall demand on employment status was to be covered by national collective labour contract and so to get the minimum wage. The riders organised with the combative syndicalist union Si Cobas and managed to win a contractual €1.10 increase in the delivery fee to €3.60. However, this significant victory was followed by the 15 most prominent organised workers being disconnected and a mass recruitment drive that diluted the organisation of the workforce. Combined with app changes designed to placate riders, the Foodora counter-offensive successfully interrupted the movement. Strikes in France were considerably less formalized than in the UK and Italy, with riders calling and enforcing strikes with little notice or overt coordination. This chaotic situation created a sense of panic amongst platform management, with Deliveroo even threatening call the police on striking riders in Marseilles, who had set up a picket outside a popular restaurant. The first protest brought 80+ Deliveroo and Foodora riders together for a joint demonstration. In Germany, organization began in April 2017 when the Free Workers Union (FAU) launched their food delivery platform organising campaignin Berlin. Their demands were: transparency about hours worked, enough guaranteed hours to live on, €1 more per drop and one hour a week paid time for shift planning. For the first time, the campaign had a large base in multiple food delivery platforms. The first protest was held in May and brought 80+ Deliveroo and Foodora riders together for a joint demonstration, calling for negotiations. A second demonstration held at Deliveroo and Foodora head offices in June attracted similar numbers. This continual pressure has forced Foodora to enter into negotiations with the FAU in Berlin, although Deliveroo are still holding out. Spain saw some of the largest strike action yet. When Deliveroo responded to a campaign of worker-led demonstrations with victimisation, by disconnecting 13 prominent workers. However, the struggle continued and developed into a national three hour strike (between 8-11pm) of Deliveroo workers in Barcelona, Valencia and Madrid on the 2nd of July. Participation was high: in Barcelona, 150 out of the workforce of 230 were on strike. They demanded a minimum of two deliveries per hour, 20 guaranteed hrs of work per week and an end to the victimisation of unionised workers. Mass strike of precarious couriers, Milan 2017. Credit: Deliveroo Strike Raiders. Back in Italy, workers were pursuing the legal route to a different employment and collective bargaining status, and have been supported by the left wing party Sinistra Italiana. 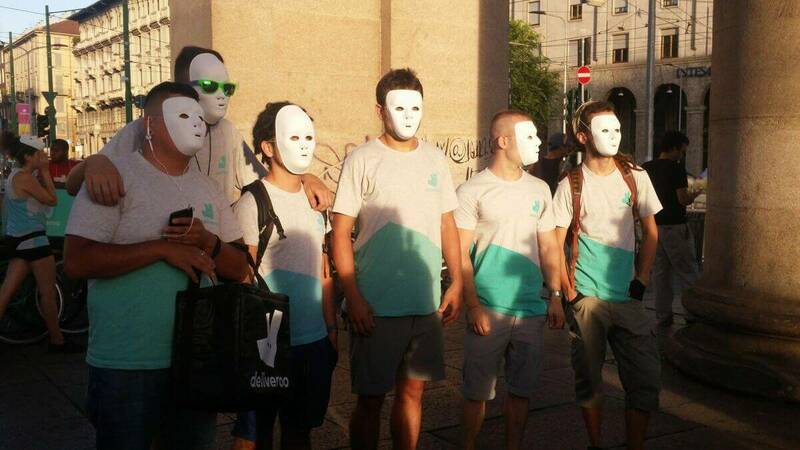 Mobilisation also began in Milan, with another critical mass strike on the 15th July bringing together workers from Foodora, Deliveroo, and Giovo to demand sick pay and insurance in case of accident. 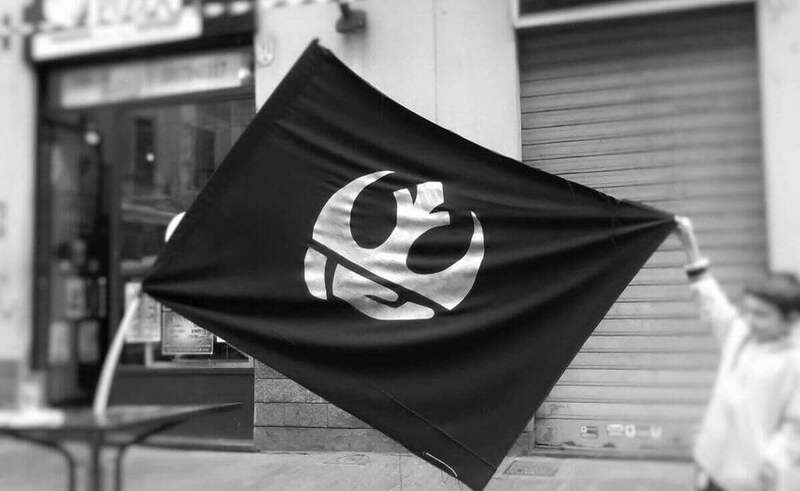 There is now evidence of organization spreading even further across Europe – workers from countries like the Netherlands, Austria and Greece have joined international organizing meetings led by German, Italian, and Spanish riders. Wherever they operate in Europe, food delivery platforms rely on the same fundamental business model. They use a platform to mediate between food providers, delivery workers and customers. Each party uses an app to interact with the others, and the labour process is controlled through algorithmic management. This means that most of the time workers respond to commands generated by an automated system contained within what labour scholar Trebor Scholz calls a ‘black box’. The platform itself owns very little fixed capital, outsourcing all delivery costs to the riders who have to provide their own bikes, data and so on. To all intents and purposes, the workers already own all the means of production required for the delivery process – with the vital exception of the coordinating platform and its algorithms, which remain firmly in the hands of the boss. Image Courtesy of Taylor Herring on Flickr.com. These workers are engaged through a non-standard employment relation, the precise nature of which varies from country to country. Universally, however, these non-standard statuses work on the principle that you can be a worker for less of a wage than a worker. This is an attempt to reduce the cost of labour-power, the price of which was set through historical processes of class struggle, and it is mostly successful in undermining the old victories of the workers movement and the social democratic settlement. These non-standard statuses are the product of a capital-state relation which is also producing wider structural reforms of the labour market with the same goal; Renzi’s Jobs Act in Italy, changes to trade union law, apprenticeships and welfare in the UK, the Loi Travail in France, long term wage suppression in Germany, the Spanish 2012 labour law and so on. These two processes are very directly linked: platforms like Uber often use money raised from venture capitalists to aggressively lobby for changes to legal and regulatory frameworks, in the process creating the conditions their business model needs in order to thrive. This transnational similarity in the organisation of labour is what has allowed for the very rapid spread of food delivery platforms in an attempt to monopolise and gain network effects. But as well as allowing the rapid spread of food delivery platforms, this similarity has created the conditions for the rapid circulation of a common form of workers struggle within those platforms. 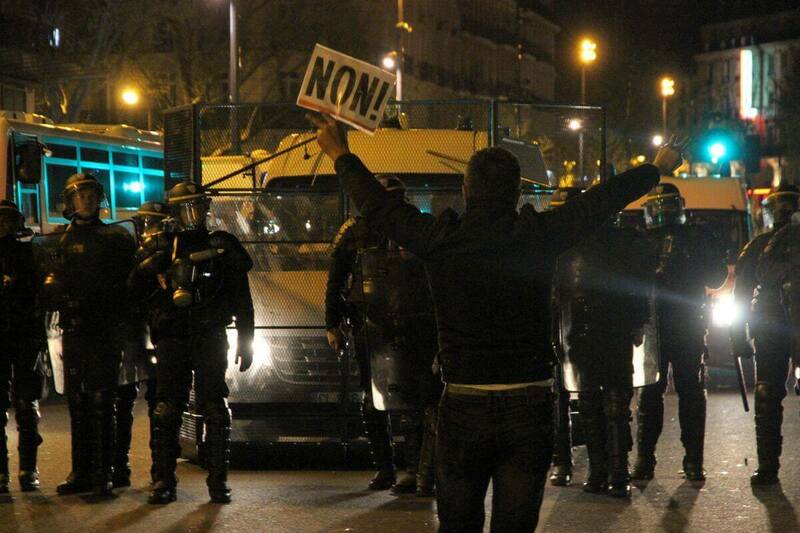 The Nuit Debout protests 2016. The Italian workerist Romano Alquati once made the point that no worker struggle is ‘spontaneous’: if you think it is, then you have just missed the invisible organisation that produced it. The invisible organisation of food platform struggles seems to have come from two converging streams of experience. The first is the labour-process itself. Precarious delivery workers managed to forge community under unorthodox circumstances, mostly via groups on encrypted instant messaging apps. Sometimes, converging at ‘zone centres’ or common points in the city also led to mass meetings and assemblies which could not be controlled by the platform due to the lack of on-the-ground supervisory apparatus. The second is the networks of invisible organisation which grew from the subjective experience of the movements that followed the 2008 crash. Rather than coming from an experience of previous conflicts on the shop floor, many of the organisers and supporters of these platform struggles had been formed in that particular period of social movements in the squares, campuses and streets. Where these two streams have met, immediate rank and file organisation has been the result. Disparate and supposedly disempowered workers find their power when they meet each other in the streets. This rank and file organisation has generally resulted in workers using very similar means do develop leverage against their platform. Chief amongst these is the strike, which is combined with a critical mass/flying picket and reinforced by social movements. The leverage of the tactic comes from two sources. First is the mobile blockade/parade of the social movement, which makes a claim to the streets of the city and connects with the working class in situations beyond the workplace. This dynamic has often produced strong ‘public opinion’ support for riders, and given social movements a strong focus on structural questions of exploitation. When this tactic is employed, there is no potential for the struggle of food platform workers to be sidelined as purely ‘economic’. Second is the withdrawal of labour of the trade union. Flexible workers withdraw their labour en masse and picket the city, connecting with other riders, restraints and customers and drawing them into the work stoppage. Disparate and supposedly disempowered workers find their power when they meet each other in the streets. In every instance of this strike wave, all the dynamics of the demonstration are at play alongside the critical question of labour. IMAGE: via IWGB Couriers and Logistics Branch. The synthesis between social movement and labour movement even developed to the point that food delivery platform workers acted as scouts for militant street demonstrations during the movement against Loi Travail in France. Their mobility and knowledge of the city allowed them to outmanoeuvre the police in order to combat the very kind of labour law which created their own precarious conditions in the first place. This dynamism was possible in part because of the direct use of the strike weapon that was made possible by non-standard employment relations. When the legal protections of employment were dropped in order to more fully exploit the worker, the legal protections of the employer against the worker vanished too. Suddenly, wildcat strikes were the only viable kind of strike. Labour militancy was unrestrained by the conventional state repression of strikes and worker organisation, resulting in the potential for the rapid development and spread of strikes without large trade union involvement. 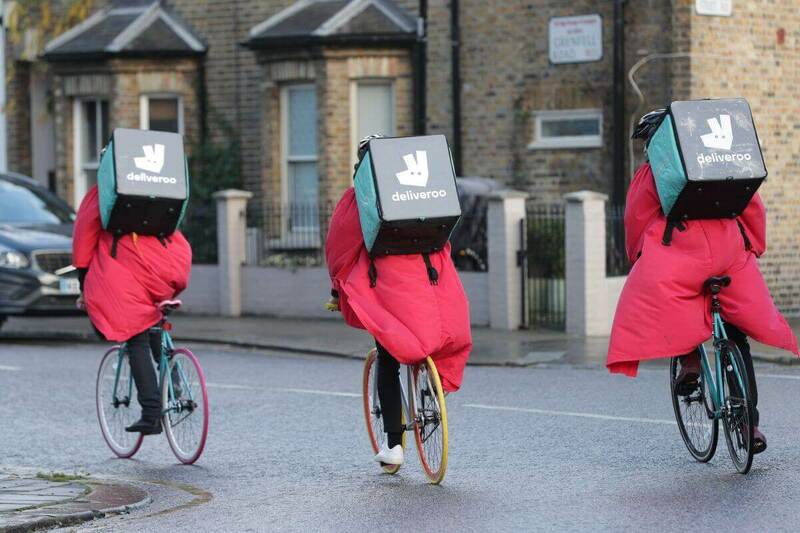 The remarkable existence of a transnational strike movement across food delivery platforms is evidence that the development of what has been called ‘platform capitalism’ is not a conflict-free process. Whilst class struggle is not yet at a stage where it can shape the development of the sector, it’s no longer impossible to imagine that it could become a determining factor. If the strike wave continues and we see a growth of increasingly connected and powerful food platform strikes, there is a potential for further developments in the self-organisation of precarious platform workers under conditions of algorithmic management. The transnational movement has developed some significant insights for the transnational movement against capital. Both algorithmic management and platform capitalism are phenomena that go far beyond just food delivery. Supermarkets and warehouses are increasingly reorganised with algorithms determining the labour process, and platform workers range from taxi drivers working for Uber to the general labourers of Amazon’s Mechanical Turk. If the militancy of the food delivery platform workers spreads towards these two other groups, then the level of conflict over exploitation in Europe would increase significantly. There are some signs that this spread might be taking place: organisers are already taking steps to prepare for a blockade of key Amazon logistics infrastructure on black Friday. The transnational movement within platforms has developed some significant insights for the transnational movement against capital. This article has been reposted from politicalcritique.org with permission to republish and digitally distribute, with the full support and consent of the Krytyka Polityczna team and European Alternatives.